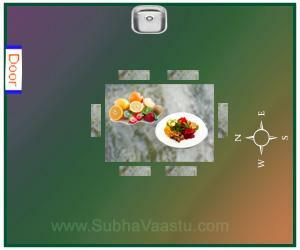 Vastu tips for Dining Room (Breakfast/lunch/Eating Area/supper/dinner/Tiffin) makes sure that the food you are eating will have positive effects or it may supports for little bit expected vastu results on you and your family. There are plenty of things that are required to be considered, while giving the right Vaasthu remedies for dining room like the proper location of dining room, proper placement of dining table, position of electronic gadgets, thedirection you are facing while taking food etc. We wish to provide unique Vastu Tips regularly, your support is highly appreciated to update. Let us know what all you are looking from us in this Vastu Website. You may plan for dining room at any where in the home except Southwest portion. Most of the other parts of the home is suitable for the dining table placement. In our observations Southwest is not providing good results, other than remaining directions we may get expected results, please note that there should not be crosswalks while planning for this dining table. It was shown in the Vastu for Dining Room link. If you want to place a fridge (Refrigerator) in the dining room, then Southwest direction would be just apt for the same, if there is no space to keep fridge at Southwest then set it at South or West portion. If you don't have such places to keep it then plan to keep it at Southeast or Northwest. Maximum try not to keep it East or North directions. Don't keep it Northeast. Kitchen is the proper place to prepare your daily meal (in olden days our elders doesn't have dining table or dining room, they are taking food in kitchen rooms only) but never face South while having your meals it creates stomach disorders, indigestion and other related problems, this points has little elaborately explained in vastu tips for kitchen link. If you want to make provision for the fitting of washbasin in your dining room, then the right place would be either Eastern or Northern or Northwest corners, maximum try to not to keep at Southwest portion. We also observed in many properties there are wash basins kept at Southwest. Maximum try to not to keep wash sink at Southwest. Dining table should not be sticking to the wall. Maximum try for this, or sticking to the wall is must then go for West or South side walls only, at any cost dining table should not be stick to the Northeast corner. Maximum try to not to keep touching the East or North side walls also. Square or rectangle shape dining table is just perfect for the room, now a days the round tables are flooding the market, there is no problem by putting the round dining table at the dining room. We seen lots of varieties in dining tables you may buy one which is more comfortable for your needs. If you bought the round table then you may plan to keep very near to Southwest of the dining room. Make the room four parts in your mind and keep the dining table very near to Southwest part. Construction should be done in such a manner that the dining room and kitchen both are on the same floor, lying adjacent to each other or equivalent to same with each other, and one hint here also is that the dining room and kitchen may have small Windows to exchange the food items, but to do before this has to take suggestion from expert vastu consultant. We may find this small window type systems at darshini (self service) hotels, where food is transferred from the kitchen to serving areas. Always keep the dining Table at center of the room and maximum near to the Southwest portion and if the door is towards Northeast-north then will get good digestion and food became Amruthahar. Good ventilation and good air is totally recommended to dining table area or dining room. So better to keep broad windows to this room to facilitate frequent air flow, note that good air helps to have taking food a pleasant one. If you don't have windows to the dining room, and you are using only a artificial air through fan, this would not be a good method. In some houses there is no way to get fix windows in dining rooms, for them try to fix ventilators atleast, if its also not possible then plan for keep atleast two doors to get cross air enters into this room. We have to take food in good air and good ventilation. This is the way our elders said. While taking food, play continue music at dining room, the music like Veena, Flute, Shehnai, Harmonium, Gettuvadyam, Sitar, Tabala, Nagaswaram, Gitar, Sarod, Mridangam, Piano, Tabla, Violin, Saxophone, Chenda, Tambura etc this is the one of the best and most valuable tip from our SubhaVaastu.com website. Many residents now taking food by watching the Television channels sitting in living rooms, if there is a crime scenes goes on at TV the food may go inside by taking that crime scenes, it is natural. Take food by hearing good music, that would be great recommendation. The music should be mild, it should not have huge sounds like drums, beats etc. If you are hearing the flute sounds while taking the food, you may observe the changes gradually in future what is going different with your health and particularly your thoughts, yes your thoughts would became very pleasant and you will get more peace in your life. Bad thoughts never comes to you if you continue by following this method. Its not a costly alteration, very simple, now we got Android apps, just select one radio or channel to get music. For example you may download desi radio app and devotional or Instrumental, flute or any other music etc. Just search you will find everything. Our Rushis (saints) voice do this for best results, cultivate the habit of listening to soft subdued music rather than having the television on at dining room. Television kills conversation and these days where parents have work pressures and children have a burden of studies, meal time can utilized to spend quality time together with the whole family. Food with good music is strongly recommended. If your kitchen is towards Northwest then it is most profitable to have the dining room in the West side of the building. If it is in the East or the North it is tolerably little good. While taking food, the head of the family should sit facing the East. Others should sit facing the East or North. However, try to nobody should sit facing the South. If it is done, unnecessary small quarrels may took place. Don't worry they are very minor only. Nature portraits and paintings in the dining room makes the atmosphere very pleasant and happy. East, South or West portion of the house are for the dining rooms. Stimulate your appetite by painting its walls with shades of pink or orange. The dining room can be an independent room or in continuation of the kitchen, no problem, but better to get one suggestion by Vastu Expert after showing your house. In olden days, food was cooked and served in the kitchen itself. These days, the dining room can be an extension of the kitchen or drawing room. In case the kitchen is located in the South-East, the dining room can be made either in the East or South of the kitchen. If the kitchen is located in Northwest, the dining room can be made in the North or West of the kitchen. Dining means, all the members in the family has gathered and has to consume food in one place, that would be the highly recommended, talking and relaxing, as well as eating. Talk to your family members softly and sweetly with a pleasant voice. Any talk while eating should never revolve around the short comings of any family member. Do not make the dining room a classroom for your Children. Teach them with polite words, so your kids learn many things by taking food and having good knowledge to their brain. In your dining table compulsory place fruits, insist your children to consume fruits compulsory. If your kids regularly taking fruits you may see changes in their knowledge and education, fruits are most powerful in getting knowledge, power, minerals, vitamins, carbohydrates, iron etc. Your teaching stream flow has to be like this start very slowly and go tributary way. Create a pleasant environment for the Family and friends to eat and enjoy each other’s company. The atmosphere should be pleasure intimate and conducive to conversation. To enjoy the feeling of spaciousness do not have too much furniture in this room. The main focus of this room is the dining table itself. The table should be preferably rectangular. Most of the dining tables came in rectangular shape as this would be the best fitted for entire family members. There should not be any attached toilet in the dining room, this may be the wrong thought keeping attached toilet to the dining room. There is no harm in an attached room used for washing clothes or utensils. Paintings/posters of appetizing food can be placed on the walls of the dining room. WOW you know so much about dining room and kitchen from www.subhavaastu.com, can we expect tasteful food from you while in our visit to your sweet home. You are so nice and affectionate, we are not looking your hard earned money, we are strictly looking here to have good services to our society. Dining room is a place where all family members gathered and sharing their experiences in their field, the head of the family has to guide properly to have a memorable moments while all sits in dining room. Cut jokes at dining room, this creates lots of changes in your family members, every body enjoys and it may creates good vibrations overall. If you are happy every body happy, every body happy then your House will also gets only positive power. This is our elders thought, now enjoy your food. Have a Great taste ahead. Visit Dining Room Vastu link for more information on dining room. Is Indian vastu works in USA, need guidance? Which part is good in the house for Bathrooms or Toilets? Vastu consultant in Dallas, looking for vastu services? How you can locate the actual furnishings inside a family room? Which direction in the house is good when sleeping or taking rest? Which direction is best for fixing the Western commode in our toilet? Vastu expert in Florida, need vastu shastra guidance services for our home? Vastu consultant in Bangalore, need vastu shastra guidance for our house? My friend told me that vastu shastra is so helpful to protect our health, is it true? Vastu consultant in California, we are looking for vastu consultancy advices? My neighbor told that more front yard open place may not giving good results to us, why?